Get an extra ray of sunshine with your breakfast. 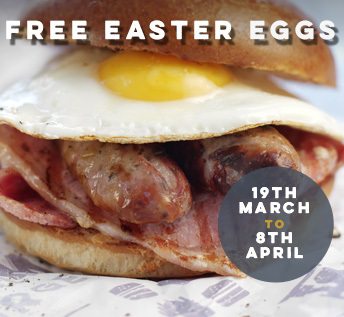 We’re giving away our free range grade A eggs throughout Easter! Treat yourself to an extra golden yolk with your bacon roll this morning or upgrade your cooked English breakfast to a double yolker for no extra charge. Plated breakfast items that already contain an egg can either have an extra egg added or will be discounted by 10%. A Veggie Happy New Year! For some deliciously dirty #vegetarian #fastfood get down to Prime Burger at St. Pancras or Euston Station and taste just how good our juicy veggie burger is...the limited time Hot & Smokey burger features our amazing veggie burger wrapped up in a Supersoft bun and laden with tangy Barbeque sauce, Chipotle Salsa, Runny Cheese, Caramelised Onions, Lettuce & Tomato...go on you know you want to! 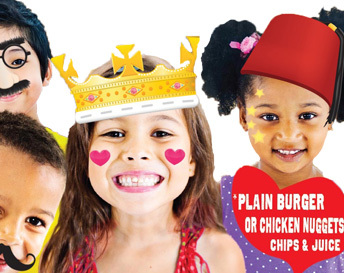 *For a limited time, from 7th January – 4th Feb. 2019, get down to Prime Burger and taste just how good meat-free can be! The Christmas Burger is back! Christmas comes but once a year…and so does our deliciously festive Christmas Burger! it’s that most wonderful time of the year to get down to Prime Burger and tuck in to succulent beef, laden with tangy stilton cheese & home-made cranberry sauce – it’s Christmas; wrapped up in a bun! Our burger patties are made from 100% British beef, bought at market by our butchers and delivered fresh daily. With Stilton Cheese supplied by the Long Clawson Dairy, a traditional British cheese producer, based in the small village of Long Clawson in the county of Leicestershire. With over 100 years of cheese making, Long Clawson Dairy has seen the industry evolve and has grown to become one of the UK's leading dairies. To top it all, our main man in the kitchen dept, Geovanni, has created the recipe for our home-made cranberry sauce, rich and a tiny bit sweet with the merest hint of cinnamon spice. The Prime Christmas burger is a festive feast, full of flavour and steeped in culinary tradition. 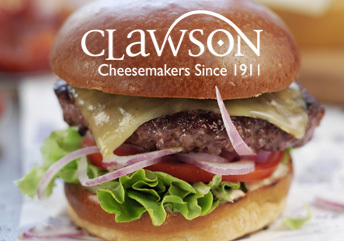 Just when you thought that our delicious Stilton Burger couldn't get any better, we're pleased to announce our new Stilton supplier - Long Clawson Dairy, a traditional British cheese producer, based in the small village of Long Clawson in the county of Leicestershire. With over 100 years of cheesemaking, Long Clawson Dairy has seen the industry evolve and has grown to become one of the UK's leading dairies. You can read more about the Long Clawson Dairy here. ‘Summer loving happened so fast…’ well maybe for John Travolta, but not so fast for us here at Prime Burger, our Summer love-in lasts for 6 whole weeks! 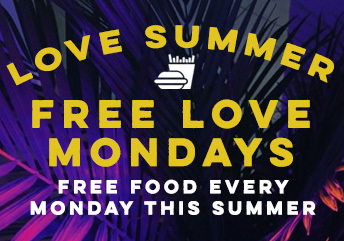 You loved it so much last year we’ve decided to share the love with you again this Summer – yes, that’s 6 weeks of free food on selected Mondays this June and July. We’ll be giving away delicious free food every Monday from 18th June – simply click here to sign-up and get your weekly FREE FOOD. 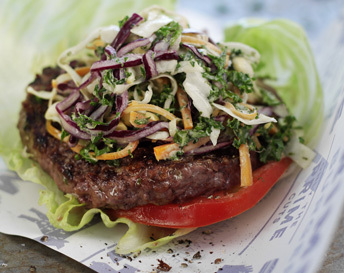 Prime Burger's Summer of Love begins on Monday 18th June and continues through to July 30th. As part of recent changes in legislation, we are committed to ensuring that your privacy is protected. 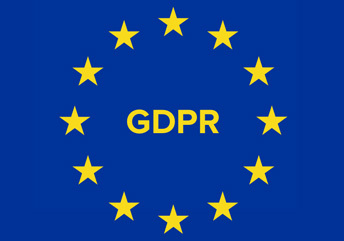 Should we ask you to provide certain information by which you can be identified when using this website, then you can be assured that it will only be used in accordance with our privacy statement. We're really pleased to share this brilliant news with you. Delaware North are the new owners of Prime Burger. The company, originally set up by husband and wife team Robert Tame and Sam Steele, was purchased by family-owned Delaware North in 2017. 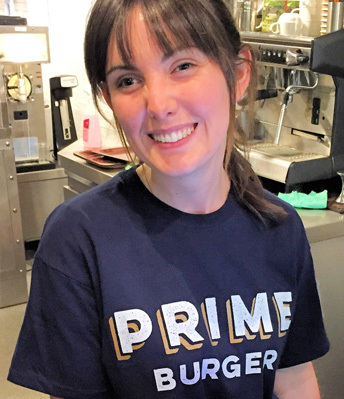 As a fiercely inclusive and gender-neutral indie, Prime Burger is immensely proud to now be part of a company that is top of the Gender Pay Gap league. 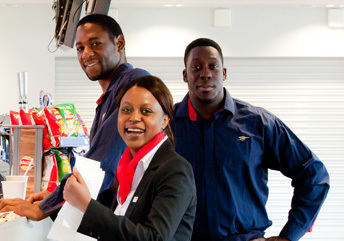 Delaware North, a global leader in hospitality and food service with significant food and beverage operations in the United Kingdom, today published its Delaware North UK Gender Pay Gap 2017 analysis. Significantly, there was no median difference in wages between men and women. This figure of 0% is an outstanding achievement compared to the UK national median gender pay gap of 18.2%. We're supporting International Women's Day 2018 on Thursday 8th March 2018. We're offering all ladies a discount of 18.4% on the day. 18.4% is the current UK gender pay gap. On average women earn 18.4% less than men, doing the same job. So we are highlighting that fact with a ladies-only discount at Prime Burger. So yeah, it’s January and it’s all about clean eating, post-xmas detox. You may think that means all food is off the menu unless it is the pulverised juice of one of the leafier members of the vegetable family or comes in a Weight-Watchers calorie counted container. Ever wondered how they make Stilton Cheese? 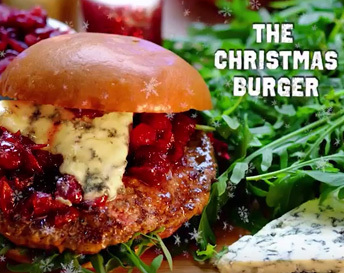 The Christmas Burger is on sale now! British beef patty, award-winning Cropwell Bishop Stilton cheese, Geovanny's home-made cranberry sauce steeped in spices. Yep it's the Prime Christmas burger. All our favourite Christmas flavours wrapped up in a freshly baked bun. On Sale NOW!